Open this book as an absolute beginner, and come away as a proud portrait artist! Mark and Mary Willenbrink's Absolute Beginner books have helped thousands of novices tap into their inner artists. 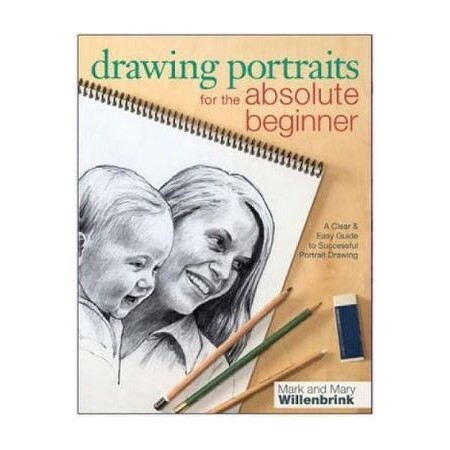 In this book, Mark and Mary help the beginning artist take on portraits, showing that absolutely anyone can draw faces. Their encouraging, easy-to-follow instruction style makes learning fun | you'll be amazed by how quickly you achieve impressive results. You may be a beginner now, but not for long! Drawing Portraits for the Absolute Beginner covers everything from warming up with sketches, and capturing facial expressions, to framing your finished work. Page by page, you'll build the skills and confidence you need to draw lifelike portraits of your friends and family. What's Inside: A simple two-stage approach to drawing portraits: sketch a likeness, then build up values to bring it to life Step-by-step instruction for drawing eyes, noses, mouths, hairstyles, hands, glasses and other tricky elements 13 complete demonstrations featuring a range of ages and ethnicities Tips for evoking more personality in your portraits by using props, costumes and accessories | Through easy-to-follow techniques, tips and step-by-step demonstrations, this book provides guidance for beginning artists to draw portraits of their friends and family. It helps readers learn about materials, basic techniques and individual facial features. It also helps readers learn how to draw people from a range of age groups and ethnicities.